RACH-C will hold the 8th annual “Children’s Festival of Russian Culture” at the NYU Performing Arts Center (Skirball Hall.) 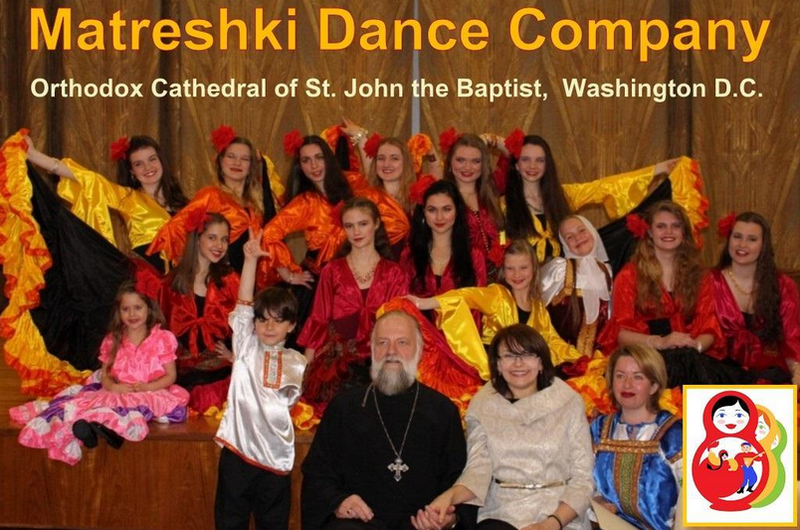 As usual there will be exceptionally talented Children’s Russian Folk Ensembles from as far as Canada and Virginia joining local NY metro area groups in providing a taste of centuries old Russian music and dance along with contemporary song and dance. NYU Skirball Center is conveniently located at the corner of LaGuardia Place and Washington Square South at the base of NYU’s Kimmel Center for University Life. The main entrance is at 566 LaGuardia Place, New York, NY 10012. In 2011, RACH-C won the “Silver Archer Award” within the category “Communications in the Global World” for its series of children’s festivals. The award comes from the board of directors of this association of public relations practitioners in Russia. Over the years, performing groups have also come from states outside New York including; Massachusetts, Washington DC, New Jersey, Texas, Connecticut, and from various places in countries such as Russia and Canada. You can learn more about this festival over the years on our website. Matreshki Dance Company is more often referred to as Matreshki Family with a tight community of 31 young dancers and 22 clan members. Most of Matreshki grew up together as parishioners of St. John the Baptist Orthodox Cathedral. However, as the ensemble grew and matured, it attracted new creative and energetic souls, opening new horizons. Princess Putyatina and Countess Tolstoy took special notice of the group, extending honorable invitations for the ensemble to most special and treasured traditional Orthodox events such as the annual Embassy’s black-tie Maslenitsa celebrations with over 300 high-profile celebrity guests and politicians. The Company was proud to share a Strathmore Hall stage with Vladimir Moiseev’s (grandson of Igor Moiseev) Dance Company of Siberia. At the age of six, the Company’s founder Larisa Strutsenko-Hargan was already a soloist at the folk ensemble “Happy Childhood” in her native city of Omsk. During her ten years there, Larisa traveled throughout Russia as a young performer, studying her country’s rich folklore, the songs and dances, customs and traditions. Later, Larisa was recruited by the Omsk ensemble Rossiyanka. Back in USSR, Rossiyanka was one of very few companies allowed to represent Russian culture outside of the iron wall at major European festivals such as ones in Germany, Czechoslovakia, and Greece. The Matreshki Dance Company follows the traditions of village masters. The show’s opening number Matreshki features the entire female ensemble with dazzling lines and circle patterns floating across the stage. Kadril is showcasing the characteristic squat kicks, walks, and lunges along with straight-legged barrel turns and exuberant spins. The rousing finale “Kazachok” features the good-natured escapades of Russian Cossacks. 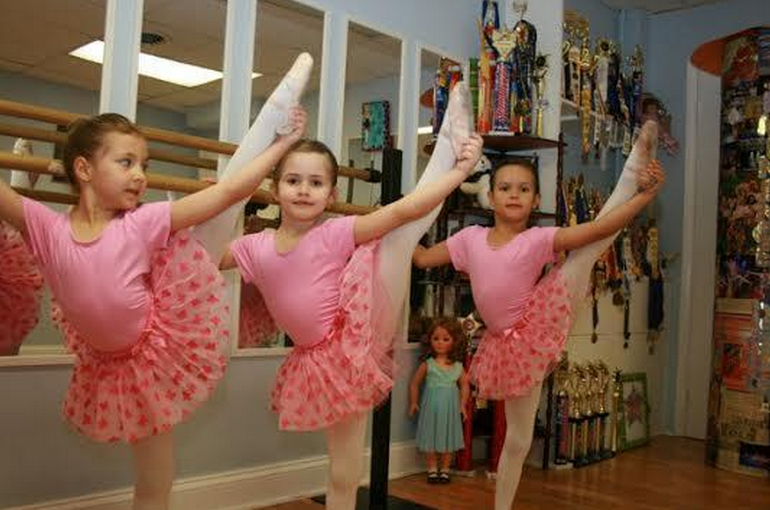 Eminence Dance & Theater Company, created 15 years ago in Maryland, today has several rehearsal halls in the vicinities of Washington, D.C. and Baltimore at its disposal, including three for children’s education programs in Potomac, Gaithersburg, and Reisterstown, MD and one in Reston, VA. The Eminence Dance School teaches ballet, folk and modern choreography, world art culture history, and theater art professionally. Aside from this, Eminence Dance invents original choreographic productions, musicals, and shows, produces theatrical, dance, and concert costumes and decorations for musicals, ballets, and other performances, publishes a magazine, organizes summer and winter children’s camps, and holds other culturally progressive and entertaining events. The Eminence dance team is a repeated winner of regional and national championships. The school’s contest team regularly wins first place in the categories of folk dance, musical theater, ballet, and other nominations. Eminence Dance’s costumes have been national champions for the past five years. The head of the school holds a special prize by the jury of the Starpower National Competition for best choreography. In Eminence Dance’s repertoire are various Russian, Ukrainian, Argentine, African, Polish, German, Italian, Spanish, Eastern, and other folk dances, many classical and contemporary compositions. Concerts and performances of Eminence’s tour group are held on prestigious stages and convention centers. The company’s countless special projects themselves include the celebration of a party by the Marriott brand by personal invitation of Bill Marriott, the Ukrainian Spring Festival with an invitation by People’s Artist of Ukraine Nina Matvienko, folk festivals under the patronage of the Mayor of Baltimore and the Governor of Maryland, Washington’s G-Fest, and performances in the embassies of many countries. Roy H. Mann Instrumental Music Department is represented this year by two Honor Groups. one of them is Select Concert Band with the special instrumental music program of Russian classical, popular and folk orchestral music and the other one is Jazz Ensemble playing exclusively American music unmistakably identified by everyone in the world as Jazz. Both groups are proud award recipients at numerous official and unofficial events. They acquired thirteen official New York State School Music Association awards as well as awards and trophies at High Notes NYS festivals, Heritage Performance PA festivals and Performing Arts Consultants festivals, The official NYSSMA (New York State School Music Association) awards include Gold Ratings for both groups. Additionally, Roy H. Mann Honor bands were selected to perform at Disney Magic Music Days in Orlando, FL and were featured at a Universal Studios music showcase. In 2009, The Roy H. Mann music department received an invitation to perform at the Presidential Inauguration Ceremony in Washington, D.C. The program takes particular pride in continuing and nurturing the great traditions of Russian instrumental music, as carried on from generation to generation. All the musicians are 11 to 14 years old. Very few of them knew how to play a music instruments before they were accepted into the music program. The school population is very diverse – there are very few Russian kids in each concert band, yet every one of them feels relation to the Russian culture and feels Russian in heart. One of the main reasons for that – is Roy H. Mann’s enthusiastic music director Mr. Alexander Kaminnik. He has been trained as a classical and jazz pianist, conductor and arranger at the Gnessin Russian Academy of Music in Moscow, Russia. His inspired leadership brought acclaim and recognition to the major music program. Last year, in recognition of his long successful career, Mr. Kaminnik was nominated for the GRAMMY’s Music Educator Award. In January 2014 he also won one of the most prestigious Russian professional awards – the “Silver Archer – USA” diploma for nurturing and developing of Russian orchestral tradition on the American soil. Singing Stars Studio – Music school for children from 3 to 16 years. The school was founded in 2006, mainly for children in Staten Island. Our address is 867 Father Capodanno Blvd, Staten Island, NY 10305. It is a beautiful place at the ocean side of Midland Beach. The founders are Aya Petersone and Euguene Jansons. Aya has special musical education and choir teaching, with extensive experience in pro teams in Riga, Latvia. Eugene Jansons was pianist and musical director of the Riga Variety Orchestra “REO”, worked closely with Raimond Pauls in the 70s and 80s, and became the musical director of the ensemble Laima Vaikule in 1985. Janson has worked in the United States as a show producer and band leader in restaurants like Lido and Tatiana. He created and produced more than 20 shows in New York and Miami with Aya Petersone, and was a mentor to many famous singers in the United States. We are ready to release an annual CD. We have also created music videos of our students performing that can be seen on YouTube channel, “ArtLibitum”. Despite the busy schedule we plan to open a branch school in Brooklyn, in the next academic year. 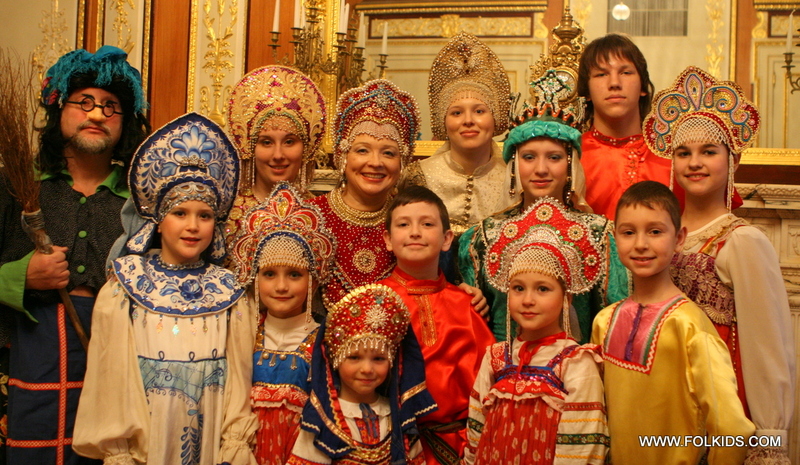 Russian Children’s Chorus, named after I. Dunaevsky is a non-profit educational organization dedicated to preservation of Russian cultural music heritage. Children ages four to fifteen are accepted based on their musical abilities. Russian Children’s Chorus performs at different Russian cultural events such as New Year’s celebration, May 9 World War II victory day concerts as well as at different Jewish festivals at Kings Bay Y. The repertoire includes many famous Russian Children’s songs of soviet era in addition to the Russian folk songs and some American songs. Dancing Crane – The Children’s Georgian Choreographic Ensemble “Georgia” is part of the children’s program of the Dancing Crane Georgian Cultural Center in Brooklyn at 6401 20th Avenue. Children between the ages of 4 and 18 learn regional dances from Georgia and participate in the performing ensemble. Instructors Irina Khutsurauli and Merab Abuladze are both experienced performers formerly with Georgia’s renowned Sukhishvili ensemble. According to tradition we teach Georgian dance as a refined art form, with attention to all details of regional style, including arm and leg movements, posture, rhythm and sensitivity to the music. There is a strong emotional component from the dances and music, which are designed by long tradition to engage the joy, exuberance and aspirations of the participants. To support this the music for the dance classes is provided live by our Georgian musicians on garmoni (Georgian accordion) and doli (Caucasian drum). Performances are done in the authentic regional costumes. We welcome visitors and classes are open to new students. Georgian, Russian and English are spoken. 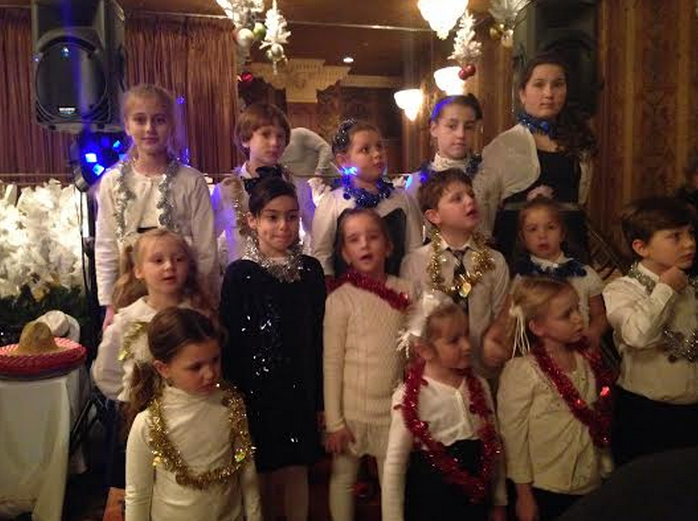 In addition to our traditional Georgian dance classes and ensemble “Georgia”, there are children’s classes in singing and musical instruments, theater, language, TV production, creation of Short Films, ballet, zumba, chess and more. 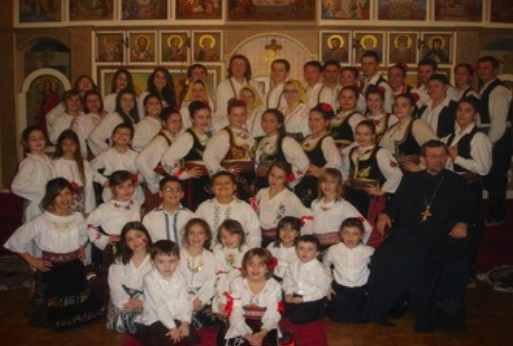 Krasnaya Kalyna dance school was created in fall of 2007, at St. Peter and Paul Church in Jersey City New Jersey. The groups are studying classic choreography, modern and folk dances of different nations. Our goal is to develop artistic skills and creativity in our students and give them a general understanding of dance as well. Our groups are participating in concerts and festivals. The creator and director of school is Nadiya Lemega. She teaches classes in folk, modern dance, and jazz. She has directed world-famous national dances such as: Quadrille(Kadril), Polka, Gipsy dance, Hava Nagila, Hopak, Syrtaki, Kolomyjka, Spanish dance. Also she has a number of dances created by herself (Modern, National, Character Dance and comic dances). Mrs. Lemega does the design of costumes, updates the repertoire constantly, and has an individual and attentive approach to training dancers. 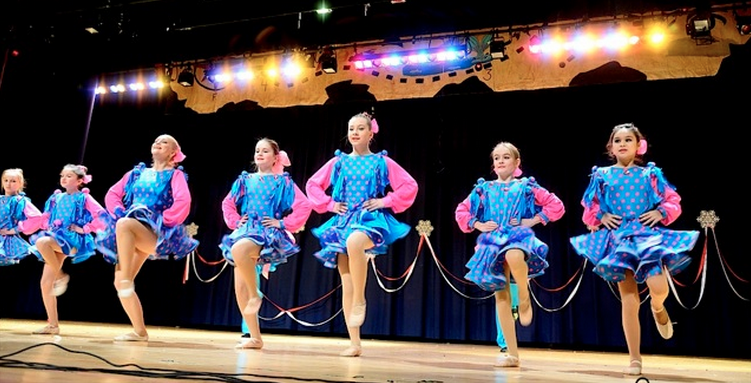 Krasnaya Kalina dance groups participated at concerts, festivals, various celebratory programs in New York (Manhattan, Brooklyn), Ellenville NY of “Sojuzivka”, Toms River NJ, Jersey City NJ, and Perth Amboy NJ. NADIYA DANCE GROUP is an adult group created six years ago in Perth Amboy New Jeresey by it’s choreograph and dancer Nadiya Lemega. The dance group repertoire consists of large variety of dance styles but mainly focused on folk and national dances. The participants of the group are mostly dance enthusiasts and were not introduced to dance before they came too Nadiya Lemega she helped them to discover a true love for dance and art. During its existence the Nadiya Dance Group had performed at dance festivals in New Jersey and New York the audience like them for colorful performance, beautiful costumes and good energy. 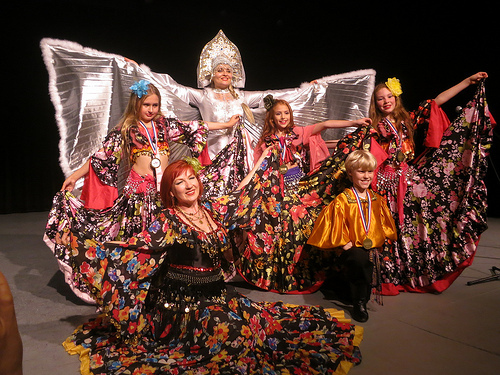 The Golden Rooster is a Russian Children’s Folk Group founded in New York in 1995 by director Irina Zagornova. A native of Russia, Irina graduated from the Musorgsky College of Music in St. Petersburg, where she studied folk singing and classical piano. Irina began the group as a way of preserving Russian folk traditions through a medley of singing, dancing, folk rituals, and musical games. Handmade folk costumes, lyrical love songs, and popular melodies make the groups’s performances educational, original, and incredibly entertaining. The Golden Rooster has regularly performed at the United Nations, the Russian Consulate in New York, the Russian Embassy in Washington D.C, and many other local and international venues. In addition, they represented America in the International Russian Folk Festival in Moscow in October 2007. Irina Zagornova also performs as a solo artist, and as a member of the adult trio Sudarushka, in collaboration with some of the most acclaimed Russian dancers and musicians in New York City.Irina Zagornova and the Golden Rooster are available for hire for public and private events. KUD DRINA: Our goal is for our children to meet other children of the same faith and culture. Through folklore we want our children to express themselves artistically and learn about the Serbian culture, language and religion. By bringing your children to folklore and church you have the opportunity to meet parents with the same background and interests. Seminars and Conferences with NYU, The Harriman Institute. Lehman College CUNY, and other scientific settings dealing with matters such as – American Adoption of Russian Children, The Russian American Diaspora and citizen diplomacy, etc. The “Children’s Festival of Russian Culture” an annual collection (8 years) of performances for families that features presentations by Children’s Russian Folk Ensembles. Establishing the first ever “Russian American History Month” in New York State (to be celebrated in 2014 for the 3rd year) . Concerts of Classic Music centered on Russian artists but inclusive of diverse performers. Cultural experiences such as our YOLKA event with the General Consulate of the Russian Federation that include adoptive families of Russian children and other non-Russian friends. “Salons” to socialize and exchange experiences with poets, writers, musicians and other thinkers at Columbia, CUNY and similar settings. This entry was posted on February 26, 2014 by Nery in 2014.